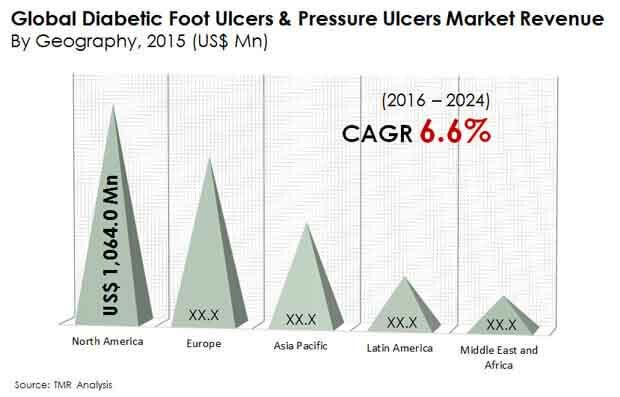 The global diabetic foot ulcers and pressure ulcers market has been prognosticated to be led by a small count of players. However, there could be multitudinous medium and large-scale organizations exhibiting their presence in the world diabetic foot ulcers and pressure ulcers market, according to a report penned by Transparency Market Research (TMR). As a result, the vendor landscape in the world diabetic foot ulcers and pressure ulcers market has been expected to remain highly competitive during the forecast years. Although established players could exhibit utter dominance in the world diabetic foot ulcers and pressure ulcers market globally, they could intensify the level of competition even on a regional platform. With three companies, viz. Molnlycke Health Care AB, Smith & Nephew Plc, and Acelity L.P. Inc., securing a commanding 50.0% share in the world diabetic foot ulcers and pressure ulcers market, the vendor landscape has been anticipated to hold a passably consolidated nature. A TMR market intelligence report suggests that the world diabetic foot ulcers and pressure ulcers market could reach a valuation of US$4.9 bn by 2024 from US$2.9 bn in 2015 at a 6.6% positive CAGR. By end user, hospital inpatient settings are predicted to rake in a staggering demand to earn US$1.7 bn in the world diabetic foot ulcers and pressure ulcers market by the concluding forecast year. By geography, North America could take a leading position in the world diabetic foot ulcers and pressure ulcers market with a 38.6% share by the same year. Chronic diseases such as obesity, diabetes, cancer, heart disease, and stroke have affected millions of people around the globe. Consequently, there have been elevating incidences of diabetic foot, pressure, and venous leg ulcers coupled with neuropathic diseases, blood flow problems, restricted mobility, and hospital admissions. This could significantly assist the international diabetic foot ulcers and pressure ulcers market to gain an unwavering impetus. Besides this, the surging prevalence of diabetes alone, aging population, favorable demographics, aggressive demand and awareness for biologics, move toward sophisticated wound care treatment, and magnifying adoption of novel technologies and products have been prophesied to achieve growth for the international diabetic foot ulcers and pressure ulcers market. Lack of prevention of chronic diseases has made the burden of healthcare costs heavier for patients and their families. The cost of treatment is generally expensive whereas loss of productivity days or work hours due to longer hospital stays is another deterrent that has been envisaged to hold back the rise of the worldwide diabetic foot ulcers and pressure ulcers market as prevention gains more focus than treatment. However, innovative and novel would care techniques and devices along with biologics could open new avenues for growth in the worldwide diabetic foot ulcers and pressure ulcers market. These offer the advantages of minimized rejection of biologics during treatments, lesser complications in post-operative and post healing care, and shortened treatment and healing time.